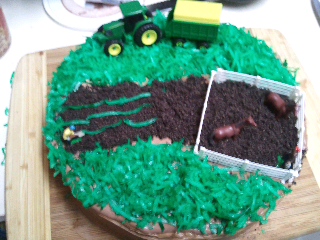 So I could not decide what kind of cake to make my soon to be three year old for his birthday. He is the kind of kid that likes everything but loves nothing. I finally decided to just go to Walmart and see where his mood took us. Well as you see it went straight to a John Deere farm set. So here is the cute guys cake!